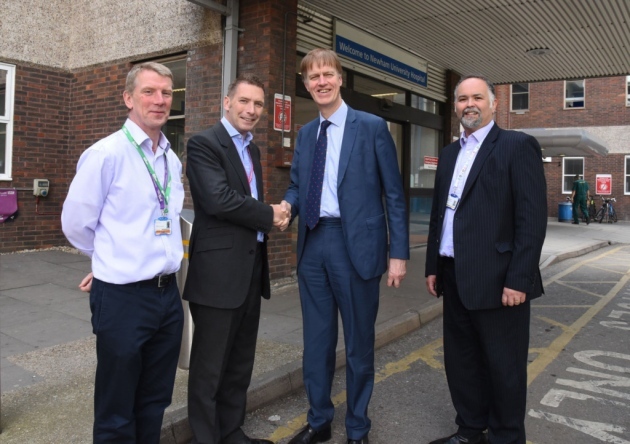 Stehen with Managing Director Chris Pocklington, Macmillan Lead Nurse for Cancer, Dr Barry Quinn, and Clinical Director for Surgery and Cancer, Dr Jason Saunders. Stephen has visited the Macmillan Information and Support Service at Newham University Hospital to see how the facility works. Macmillan helps support people during and after their cancer treatment in a variety of ways, including therapy sessions, booklets, and a phone line people can call, according to its website. This service at the Plaistow hospital allows people to prioritise what it is important to them and helps connect them with services in the community. Macmillan is located in hospitals and out in the community, in places like local libraries and shops. As of 2016, it operated 1,060 posts around England, according to an announcement.